Many nights I end up doing fly by the seat of my pants meals. I know what the main dish will be but the sides are always a mystery until I start diving into my vintage cookbooks and coming up with a plan. This is one of those recipes that comes by way of the "Rumford Dainties and Household Helps" cookbook from 1922. It needed some tweaking as Sour Cream was different back then from the thick stuff we use on our potatoes now so we have to add a little milk or risk a dry muffin at the end. They went well with our dinner that night and I think you'll like them too. Sift together dry ingredients in a bowl. Mix baking soda with sour cream and beat until frothy. Add in egg and milk and stir into dry ingredients. Fill holes in greased muffin tin to top and bake at 325° for 25 minutes. 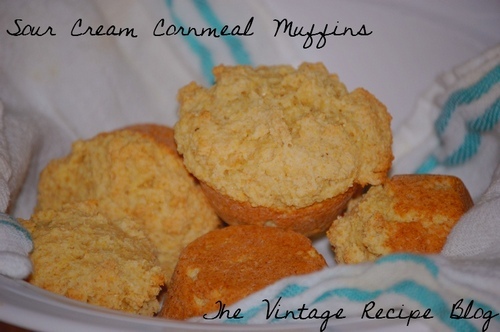 Note: Vintage recipes for muffins are for a much thicker batter than we are used to today. I just used my hands to grab pieces of dough and fill the cups on the muffin tin.